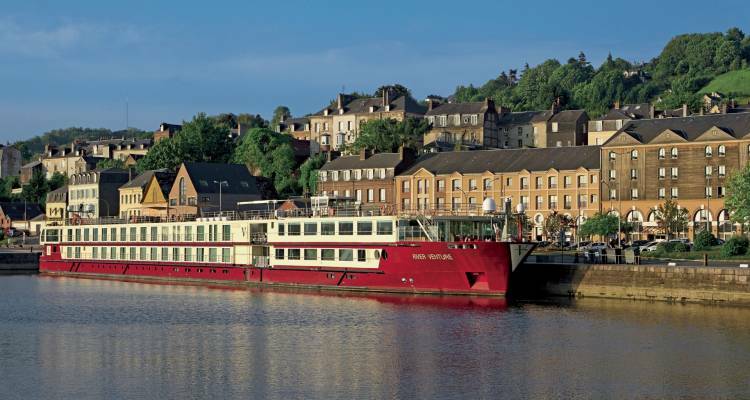 The exclusive MS River Venture has been on the Seine since its commissioning in 2013. The luxurious atmosphere on board the MS River Venture will inspire you from the very first moment. On the hotel ship there are a total of 69 outside cabins on 3 decks. All cabins are comfortably and stylishly furnished and equipped with individually adjustable air conditioning, heating, carpeting, a safe, telephone, flat TV, bathroom with shower and WC as well as optionally with double bed or separate beds. The cabins on the Main deck have windows to open, the cabins on the Middle and Upper deck are equipped with French balconies. The Main deck single cabins are 12-15 m², the Deluxe cabins 15 m², the Deluxe suites 23 m² and the Owner suite 30 m² are remarkably spacious. The cabins on the Main deck have windows to open. In the Compass Rose Restaurant you will be spoiled with local and international specialities. Breakfast is served on a buffet basis, for lunch and dinner there is a menu with a free choice of seats. Snacks in the afternoon and tea/coffee/hot chocolate are also offered free of charge. You will find space to relax on the spacious Sun deck with jogging track as well as in the Captain´s Club, where you can have your meals outdoors in good weather or in the Can-Can-Lounge equipped in the style of the Belle Epoque. The caring crew pampers you around the clock and provides additional entertainment with cooking, cocktail mix demonstrations, dance lessons and yoga lessons. A small fitness centre with cardio equipment and weights is also available. Free WLAN is available on board.